Animacam is a Festival created by animation lovers for all those passionate for this genre. From different corners of Galicia, Spain (A Limia, Santiago de Compostela and A Coruña), the Festival has always wanted to value the nearest, appeal the furthest and spread everything through an online platform able to connect the entire animation world. 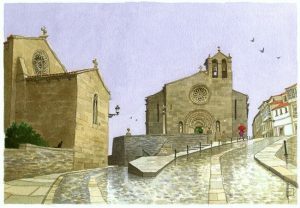 This line: “Betanzos Santa María do Azogue..”. S watercolor pencil and acrylic / paper. 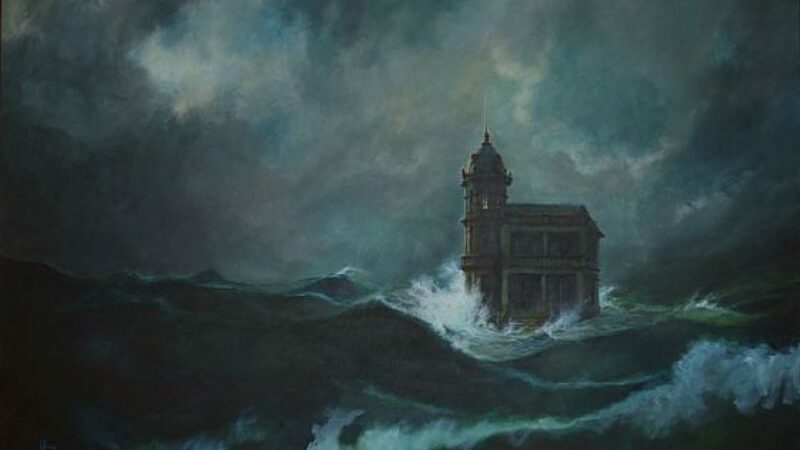 Upper illustration: “The house on the sea”, acrylics / canvas. 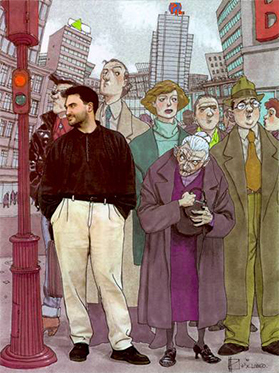 His publications have been translated and released all around the planet and he has a lot of awards, including The National Comic Award 2013 for its illustrated book Ardalén, several prizes to best work and screen in different editions of Salon del Comic de Barcelona or Genie Awards of Paris Convention in 1988. In addition, he was nominated to Harvey Awards in 1995 for the best foreign work (Streak of chalk) and Eisner Awards for the Best Painter. Besides, he obtained a Max & Moritz Award for the best children’s book in German (1998) and Alph Art Awards of Angouleme Festival 1991-1994 for his works Manuel Montano and Streak of chalk. His last works Miguel En Cervantes. El retablo de las maravillas and Presas Fáciles, which show his compromise and responsibility with both art and society, are also remarkable. Because of this, Miguelanxo Prado also organizes, from 1998 to present, the International Comic Festival of A Coruña ‘Viñetas desde o Atlántico’. Regarding his audiovisual work, we must mention De Profundis, an animation film released in 2006 which was written, designed, animated and directed by Miguelanxo Prado himself. The film was nominated in Goya Awards for Best Animation Film and it was very appreciated for the audience. He also took part on the Tv series Men In Black: The Series, produced by Steven Spielberg, creating more than 1,700 characters, and worked for different TV Channels like Canal + or Television de Galicia, creating several works such as the design of popular TV character Xabarin of the children’s series Xabarin Club. Animacam Team invite you to surf on the oceans of light and colour represented by Miguelanxo’s work. We truly hope you enjoy the different perspectives in which we’ll introduce his work along these 3 months as deep lovers of it.